Young people are the future of Europe. Our mission is to create the conditions for ensuring their optimal development and providing them with the best opportunities to be active on the labour market and in society. But young people were also the hardest hit during the crisis and according to a recent Eurobarometer, half of Europe’s young people feel excluded and marginalised from participating meaningfully in social and economic life. As President Juncker said in his 2016 State of the Union speech, "The European Union should not only preserve our European way of life but empower those living it. I cannot and will not accept that Europe is and remains the continent of youth unemployment". He also confirmed his commitment to "continue to roll out the Youth Guarantee across Europe, improving the skillset of Europeans and reaching out to the regions and young people most in need". Youth unemployment must continue to be tackled head-on if we are to fully harness the dynamism and potential of Europe’s people, and all instruments available at EU and national level must be mobilised fully. This is also the objective of the new Youth Initiative announced in the 2016 Letter of Intent addressed to the President of the European Parliament and to the President of the Council where existing processes that work are continued and reinforced and new instruments are established to address issues not sufficiently covered. This report and its conclusions are part of this initiative. Since 2013, the Union and its Member States have engaged in an ambitious strategy to reduce youth unemployment. Following a proposal from the Commission, all Member States adhered to the establishment of a Youth Guarantee, which is a political commitment, in the form of a Council recommendation of April 2013, to give every young person a good-quality offer of employment, continued education, an apprenticeship or a traineeship within a period of four months of becoming unemployed or leaving formal education. The establishment of the Youth Guarantee went hand-in-hand with policy guidance and financial support from the EU level, notably through the Youth Employment Initiative. Three years on from the launch of the Youth Guarantee, there are 1.4 million fewer young unemployed in the EU. By 2015, annual youth unemployment rates had dropped by 3.4 percentage points to 20.3 % and the number of people who are not in employment, education or training (NEET) had decreased by 1 percentage point to 12 % on average in the EU. 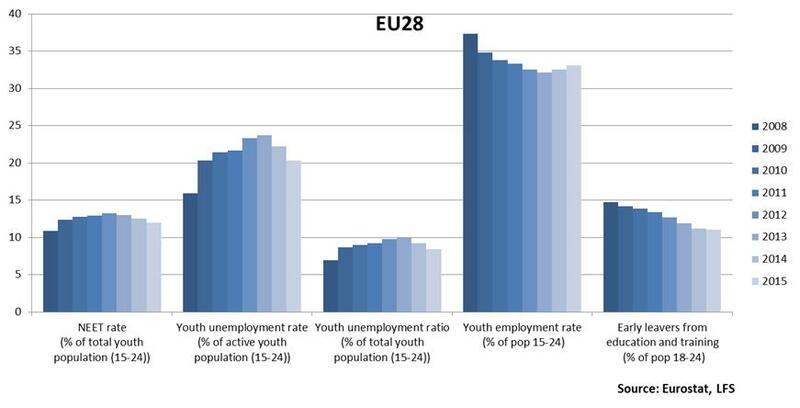 Youth unemployment and NEET rates are very uneven across the EU but both rates have decreased in most Member States. During the same period, unemployment dropped faster for the population of young people than for the adult population, in the EU as a whole as well as in many Member States. This suggests that the structural reforms of labour market, education and training policies supported by the Youth Guarantee have made a difference. The Youth Guarantee has become a reality across the EU. 14 million young people have entered Youth Guarantee schemes since January 2014. Around nine million young people took up an offer, the majority of which were offers of employment. Almost two thirds of young people who left the Youth Guarantee in 2015 took up an offer of employment, education, traineeship or apprenticeship. 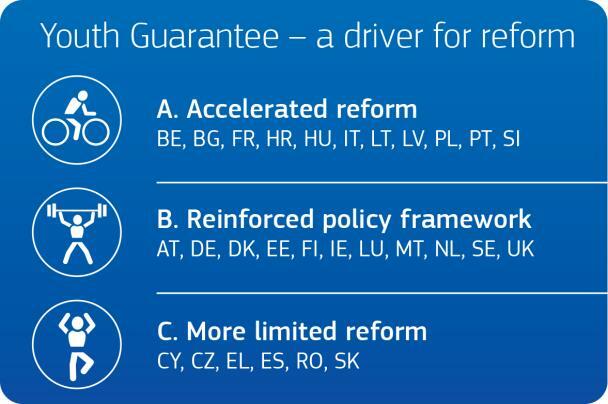 The Youth Guarantee has significantly facilitated structural reforms and innovation in policy design across Member States. It is complemented by other initiatives such as the new Skills Agenda or the Alliance for Apprenticeship. Nevertheless, youth unemployment remains unacceptably high and many challenges still need to be addressed by Member States. Continued political commitment to the Youth Guarantee as a long-term, structural reform will be required in order to effectively reap the benefits of the work carried out so far. Greater internal coordination and capacity building among those involved, such as public employment services and education and training providers, will consolidate promising partnerships and improve delivery. And finally, much more remains to be done to bring hard-to-reach groups and those furthest away from the labour market to the Youth Guarantee pathway. Significant EU financial support was mobilised in support of this process. Over the 2014-2020 period, the European Social Fund will directly invest at least EUR 6.3 billion — in addition to the Youth Employment Initiative — to support the integration of young people into the labour market under the same investment priority. In addition, the Youth Employment Initiative (YEI), with an initial EUR 6.4 billion financial resource, has for the first time ever provided direct targeted support to young NEETs living in regions struggling with youth unemployment rates higher than 25 %. In 2015, the Commission decided to speed up the implementation of the YEI by increasing the pre-financing to Member States by almost EUR 1 billion. Based on the initial results and on the assessment of needs until 2020, the Commission has just proposed to prolong the funding of the YEI by adding EUR 1 billion from the EU budget, to be matched by the same amount from the European Social Funds allocation of the eligible Member States. In 2013, in the midst of a crisis that had a severe impact on young people’s employment, Member States committed to a comprehensive approach to tackle youth unemployment as a particular and immediate objective. 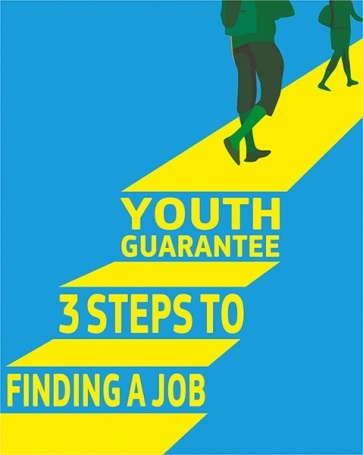 The Youth Guarantee was therefore established to provide all young people under the age of 25 with a good-quality offer of employment, continued education, or an apprenticeship or traineeship within four months of becoming unemployed or leaving formal education. 2 By improving school-to-work transitions and investing in young people’s employability, the Youth Guarantee aimed also to prevent a loss of growth potential due to de-skilling, loss of social cohesion and exits from the labour market that would risk taking a heavy toll on Europe's economy, especially at a time of rapid ageing. Several EU initiatives were also taken alongside the Youth Guarantee. The European Alliance for Apprenticeships was launched in 2013 to improve the quality, the supply and the image of apprenticeships in Europe. The Council Recommendation on a Quality Framework for Traineeships was adopted in March 2014. The 2015 European Pact for Youth builds on these initiatives by promoting quality business-education partnerships. Three years on from the launch of the Youth Guarantee, there are 1.4 million fewer young unemployed people in the EU and the number of young people not in employment, education or training (NEETs) has dropped significantly, although with unequal results between Member States. Figure 1 provides a snapshot of the very diverse youth unemployment rates in the EU in early 2016 and highlights which Member States have seen the biggest reduction in youth unemployment since 2013. Young people’s labour market performance has surpassed other age groups since 2013. Even though there could be other factors to take into account, such as a greater cyclical sensitivity of young people to macroeconomic conditions, structural reforms of labour market, education and training policies – supported by the Youth Guarantee – have been contributing factors to this result. The Youth Guarantee has become a reality across the EU. Swift implementation took place from 2014 onwards. Since then, more than 14 million young people have entered Youth Guarantee schemes, and an average of nearly two million young people were registered at any one point in time. 3 Around nine million young people took up an offer of employment, education, traineeship or apprenticeship under the Youth Guarantee. A large number of labour market reforms targeting young people were adopted in most Member States in 2013-2015. The Youth Guarantee helped not only to scale up both demand- and supply-side measures for young people but also acted as a powerful policy driver for reform. In doing so, it significantly facilitated structural reforms and innovation in policy design, promoting investment in human capital and upward convergence across Member States. It also helped to increase partnerships between the world of work and education. Despite these positive developments, renewed efforts are needed to support the young people who are furthest away from the labour market, i.e. the NEETs who have benefited the least from these improvements. Significant EU financial support was mobilised in support of the Youth Guarantee through the European Social Fund (ESF) and the Youth Employment Initiative (YEI). The YEI was launched in 2013 with EUR 6.4 billion of financial resource to provide — for the first time ever — direct and targeted support to young people not in employment, education or training residing in regions with youth unemployment rates higher than 25 %. This Commission decided to speed up the implementation of the YEI by providing increased pre-financing to Member States of almost EUR 1 billion in 2015. Based on initial results and on the assessment of needs until 2020, the Commission has now proposed to prolong the funding of the YEI by adding EUR 1 billion from the EU budget, to be matched by the same amount from the ESF allocation of the eligible Member States. Over the 2014-2020 programming period, the ESF will — in addition to the YEI — directly invest at least EUR 6.3 billion to support the integration of young people into the labour market across Europe. Since 2013, the European Investment Bank provides a two-pillar programme entitled 'Skills and Jobs – Investing for Youth'. 4 The 'Investing in Skills' pillar supports investments in human capital (e.g. job-related skills and on-the-job-training, as well as vocational training, student loans and mobility programmes). During 2013-2015, the EIB signed almost EUR 7 billion via this pillar. In addition, the 'Jobs for Youth' pillar provides access to finance linked to the employment of young people in SMEs. Between July 2013 and December 2015, over EUR 26 billion was allocated to beneficiary SMEs. This Communication is the Commission's response to that call and also reflects messages from the Council, 6 the European Parliament 7 , social partners and key stakeholders. It reviews the steps taken in Member States and at EU level to implement the Youth Guarantee and the YEI. The Youth Guarantee is a structural reform that has been rapidly implemented across the EU thanks to an unprecedented combination of high political momentum, significant financial resources through the YEI and the ESF, and robust monitoring mechanisms at EU level. All Member States defined their strategic approach through specific Youth Guarantee Implementation Plans. 9 They included both short-term measures that provided an immediate response to the high levels of youth unemployment and inactivity, 10 and a vision for longer-term structural reforms to improve school-to-work transitions. Implementation started in 2014, with key measures being rolled out progressively. The Youth Guarantee ensures that all young people under the age of 25 receive a good-quality offer of employment, continued education, an apprenticeship or a traineeship within four months of becoming unemployed or leaving formal education. The coordination of national Youth Guarantee schemes falls in most cases upon the ministry in charge of labour, while public employment services generally act as the main entry point. Alternative providers (including chambers of commerce, industry and crafts, youth centres, education institutions and providers and municipalities) are involved in about one third of Member States, and young people can register through specific online Youth Guarantee platforms in three Member States. While a majority of Member States target young people under the age of 25 as set out in the Council Recommendation, 13 Member States have extended coverage to target those under the age of 30. In most Member States, the time limit for delivering an offer is set at four months, in line with the Council Recommendation. Young people’s labour market performance has improved significantly since 2013, which was a tipping point in the reversal of key indicators (see Figure 2 below). By 2015, annual youth unemployment rates had dropped by 3.4 percentage points to 20.3 % and NEET rates had decreased by one percentage point to 12 % on average in the EU. Since the reversal of youth labour market trends in 2014, both youth unemployment and NEET rates have decreased in most EU Member States. However, NEET trends for some Member States with the highest rates in 2013, in particular Italy and Romania, have seen little change. Overall the reduction in the NEET rate at the EU level appears to have been due to both transitions towards further education or towards employment, with differences across Member States. The Youth Guarantee has helped boost labour market demand for young people and has supported job creation measures. In implementing the Youth Guarantee, most Member States have used recruitment subsidies, in many of them with support from EU funding. The effectiveness of such schemes has also improved thanks to a greater focus on targeting, training, and follow-up of young people supported by recruitment subsidies. -Group A (accelerated reform): the Youth Guarantee has provided a new impetus and has accelerated policy developments in a number of Member States, especially in those facing major challenges and receiving significant EU financial support (BE, BG, FR, HR, HU, IT, LT, LV, PL, PT, SI), though stages of implementation might differ. -Group B (reinforced policy framework): the Youth Guarantee has helped to reinforce well-established policies through the scaling-up or adjustment of existing measures in Member States that already had comprehensive instruments in place that are broadly in line with the Recommendation (AT, DE, DK, EE, FI, IE, LU, MT, NL, SE, UK). -Group C (to date, reform is more limited): changes were more limited as a result of a variety of factors including a lower prioritisation, delays or discontinuity in key measures, or a focus on pre-existing schemes (CY, CZ, EL, ES, RO, SK). The Youth Guarantee has helped to break down silos across policy areas and build viable partnerships. Coordination among the employment, education and youth policy sectors has been heightened, most notably as a result of the impetus created by Member States’ Youth Guarantee Implementation Plans. New partnerships were set up with social partners and youth services, including youth organisations. In particular, youth organisations have been involved in the design and delivery of national Youth Guarantee schemes, although to varying degrees across Member States. Significant apprenticeship and traineeship reforms have helped better prepare young people for labour market needs and build relevant skills, but have also helped strengthen business community engagement. Half of the Member States have undertaken — or report plans to undertake — legal changes to align their national framework with the Quality Framework for Traineeships following its adoption in 2014. 17 Nearly all Member States have taken action to improve the quality, supply, or attractiveness of apprenticeships, in the spirit of the European Alliance for Apprenticeships launched in July 2013. Engagement from the business community was crucial and led to new commitments, for example under the European Pact for Youth (see Section 3.3). The majority of public employment services have improved the targeting of their services and have expanded their existing service offer to young people; two-thirds of public employment services established specific targets for their youth-oriented services. 18 Particular emphasis has been placed on reorganising structures and increasing the personalisation of counselling. Staff capacity has also been reinforced, with specific training provided by over half of public employment services in 2014. In addition, Member States have broadened the scope of support through short study or work placements, and pathway approaches towards the hardest to reach. The emphasis on early intervention and non-registered NEETs highlighted existing gaps in service delivery and ensured a new focus on outreach. Most Member States encouraged young people to register with Youth Guarantee providers and two-thirds of public employment services engaged in outreach work when implementing the Youth Guarantee. Increasing awareness, accessibility and the range of services was instrumental in this regard, through the development not only of online registration and targeted campaigns but also of one-stop-shops, mobile or decentralised services and proactive work with a broader range of partners. While results are becoming visible on the ground, Youth Guarantee schemes have not yet reached all young people who have become unemployed or left school. In Belgium, the Brussels region launched in May 2013 the ‘Transition Traineeship’ targeting young job seekers and students with low educational attainment. It focuses particularly on coaching and follow-up. Twelve months after the end of the traineeships, total positive outputs (including employment and return to education) reached 73 % for the trainees, against 47 % in a control group. In Bulgaria, a network of youth mediators was put in place in 2015 to reach out to non-registered NEETs in their direct environment and activate them. Youth mediators act as intermediaries with public institutions that provide social, health, educational and other services. During the period May-December 2015, youth mediators consulted 5 078 young people. In 2015, Finland launched one-stop-shops in 35 municipalities, funded mainly through the ESF, with additional national funding. They aim to strengthen and simplify services for young people below the age of 30 through personal advice and guidance, support in life management, career planning, social skills, and education and employment support. In Italy, the Youth Guarantee prompted changes that were reflected in the broader reforms initiated by the Jobs Act. The number of young people registered with the scheme has been increasing steadily to reach more than one million by 1 March 2016. In Latvia, the ‘Know and Do’ project supports outreach work at the municipal level. It aims to identify, motivate and activate non-registered NEETs aged 15-29 to return to education, employment or training. Initiated in autumn 2015 with support from the ESF, it aims to support 5 260 young people. In Slovenia, the First Challenge 2015 programme aims to support up to 2 859 young people aged 15-29 getting into work through subsidised employment for a period of 15 months, with support from the YEI and the ESF. The apprenticeship system in Spain has undergone significant structural reforms, leading to an increase in the number of apprentices from 4 000 to 15 000 in just three years (between 2013 and 2016). During the same period, the number of enterprises participating in apprenticeship training grew from barely 500 to 5 660. 14 million young people have entered Youth Guarantee schemes since January 2014. Around nine million young people took up an offer, the majority of which were offers of employment. 19 Overall almost two thirds of young people who left the Youth Guarantee in 2015 did so by taking up an offer of employment, education, traineeship or apprenticeship. Of all the offers made within the four-month period, the majority were for employment (70.2 %), followed by education (13.6 %), traineeships (12.1 %) and apprenticeships (4.1 %) (Figure 3). Despite these positive developments, more effort is needed to support those young people who are furthest away from the labour market, i.e. the NEETs who have traditionally been hardest to reach out to (even before the crisis) and have benefited the least from improvements to date. This is the case in particular for those facing poverty, social exclusion, disability and discrimination, including those belonging to an ethnic minority or with a migrant background, asylum-seekers and refugees. The drop in NEET rates results primarily from reductions in the level of NEETs seeking employment, rather than inactive NEETs, who are detached from the labour market. In 2013, the proportion of NEETs seeking employment in the EU exceeded that of inactive NEETs, while in 2015 the two categories reached the same level. This suggests that policies might have been quicker in supporting unemployed NEETs but take longer to effectively bring inactive NEETs back into employment, education or training. Falls in the rate of inactive NEETs can however be seen in some Member States, for example in Cyprus, Hungary and Portugal. Notwithstanding that the results must be viewed with caution, as the comparatively better performance of these indicators may also in part be attributed to the greater cyclical sensitivity of young people to macroeconomic conditions, the results of the analysis do suggest that structural improvements supported by the Youth Guarantee have been a contributing factor. Although unemployment in the adult population dropped during the period, it did so comparatively more for the population of young people than for the adult population, in the EU as a whole as well as in many Member States. Positive results can in particular be observed in Belgium, Croatia, Cyprus, the Czech Republic, Finland, Greece, Hungary, Ireland, Latvia, the Netherlands, Portugal, Romania, Slovenia, Spain, Sweden and the UK. The European Semester process shows sustained progress in almost all Member States that received youth country specific recommendations in 2013 and 2014 as mentioned in 2015 EMCO review conclusions and 2016 Commission Country Reports. Moreover, the added-value generated by the Youth Guarantee has been acknowledged in many external reports and evaluations that are listed in the Annex. In most Member States, the successful implementation of the Youth Guarantee has been supported by the mobilisation of EU funds on all aspects of national Youth Guarantee schemes and related structural reforms. Jointly, the YEI and the ESF are directly investing at least EUR 12.7 billion in labour market integration measures for young people for the programming period 2014-2020. The YEI, a EUR 6.4 billion Union financial resource, is directly supporting young people not in employment, education or training in the regions with youth unemployment rates higher than 25 % in 2012. It complements the ESF which supports both people and structural reforms of key systems and services. The 20 YEI-eligible countries are: BE, BG, CY, CZ, EL, ES, FR, HR, HU, IE, IT, LV, LT, PL, PT, RO, SI, SK, SE, UK. To help speed up the mobilisation of YEI-funded actions on the ground, all YEI resources were committed in the EU budget to the first two years (2014/15) of the 2014-2020 financial cycle. Several of the main beneficiary Member States called for increased financial liquidity to facilitate swift launching of YEI actions on the ground. This led to an amendment of the ESF Regulation 23 and to the Commission releasing around EUR 1 billion to Member States in 2015 in the form of additional pre-financing. Across the 20 eligible Member States, the YEI constitutes a key mechanism to implement the Youth Guarantee. In some cases, it is used to support most or all measures under Youth Guarantee schemes. In Spain, for example, 80 % of all Youth Guarantee actions are funded through the YEI. In other Member States, it is an additional funding source used to complement others. Member States use the YEI to support key actions related to the Youth Guarantee. There is a strong focus on providing a first job experience, traineeships, apprenticeships and quality education and training. In addition, more than half of all eligible Member States support young entrepreneurs or offer job and training mobility measures. In some Member States 24 the YEI is supporting financial instruments providing loans and guarantees to young people to become self-employed and set up their own business. The YEI is well focused, being targeted at specific regions and groups of young people (e.g. those young people outside both the labour market and the education and training systems). Specific result indicators act as an additional driver of quality of actions, and strengthen the result orientation of YEI interventions as compared with other actions supported with EU funds. Furthermore, national evaluations in several Member States highlight the fact that the YEI has led to a much stronger focus on individualised assistance. To date, YEI actions have supported over 1.4 million young people 25 . Although reporting on successful outcomes is only possible upon completion of the intervention, many national evaluations 26 already show that young people who have completed a YEI intervention have significantly improved chances of finding employment or continuing their studies afterwards (e.g. CY, EL, FR, IT, LV, PL, SE). Importantly, managing authorities also express a high degree of confidence regarding the achievement of the YEI objectives. Moreover, in some Member States measures are in higher-than-expected demand due to the increased interest among young people. The deployment of measures under the YEI is now on track in most Member States. YEI implementation significantly progressed in the second half of 2015 and especially in 2016. By end of July 2016 eligible Member States had selected operations amounting to over EUR 4 billion, that are either already under way or which are expected to be launched shortly. This constitutes an increase of nearly EUR 2 billion since March 2016. Half of these Member States, have committed almost the entirety of their YEI budget. Moreover, also by the end of July 2016, beneficiaries had claimed EUR 800 million for reimbursement by YEI managing authorities. Regarding the reimbursement of expenditure to Member States by the Commission, by the end of August 2016, Member States had requested the reimbursement of EUR 682 million of YEI expenditure. Over 70% of these requests for payment have already been reimbursed by the Commission (and further payments are in the process of being reimbursed). With the YEI structures set up, implementation is gaining pace in most Member States. The priority now is to pursue, and where necessary, accelerate the implementation of YEI actions. in its initial phase YEI implementation did not meet the political expectation that measures would be launched quickly. This was largely due to Member States’ lack of preparedness to design and launch relevant youth employment measures, and the lengthy process of setting up implementation systems responding to the new requirements. The new obligations stemming from the framework of the European Structural and Investment Funds (ESI Funds), that apply equally to the YEI, were an important factor in the initial slow start. In particular, Member States experienced delays in completing the set-up of monitoring systems and programme management structures (defined in the legal framework as ‘designation of authorities’). However, the ‘designation of authorities’ process has now been completed for most of the YEI-supported operational programmes. Member States are funding youth employment measures with money available from both the 2007-2013 and 2014-2020 programming cycles. Their parallel implementation led to capacity challenges as regards processing the verification of expenditure and its certification to the Commission. In the 2014-2020 programming period, the ESF will — in addition to the YEI — directly invest at least EUR 6.3 billion to support the integration of young people into the labour market. Moreover, for the 2014-2020 period Member States have allocated around EUR 27 billion to tackling early school-leaving, lifelong learning, vocational education and training. Similarly, young people are one of the main target groups of the ESF investment in entrepreneurship and self-employment, which amounts to over EUR 2 billion. Further to that, the European Regional Development Fund will be available to support education and training infrastructure development, entrepreneurship and business start-up measures for young people, on the basis of needs and opportunities as set out in national and/or regional Operational Programmes 29 . Finally, the structural reforms of Member States' public employment services necessary for the successful implementation of the Youth Guarantee are also financially supported by the ESF, both in YEI and non-YEI-eligible Member States. In the 2014-2020 programming period this amounts to around EUR 1 billion. The above ESF investments constitute important complementary funding that is crucial to implement the Youth Guarantee in all 28 Member States and thus beyond the 20 YEI-eligible countries. A number of EU regions still have a need for support under the YEI. Applying the latest annual youth unemployment data (2015) to determine YEI-eligible regions shows that 14 of the current 20 eligible Member States would today still qualify for YEI support. In addition, the Member States with the highest numbers of unemployed young people at regional level (at 40-50 %) remain the same. Several Member States (in particular Italy, Portugal, and France) have pointed out that they consider the continuation of the YEI as essential in order to achieve the ambitious policy goals they have set for themselves in addressing youth unemployment, and that they have already used all YEI resources available to them. 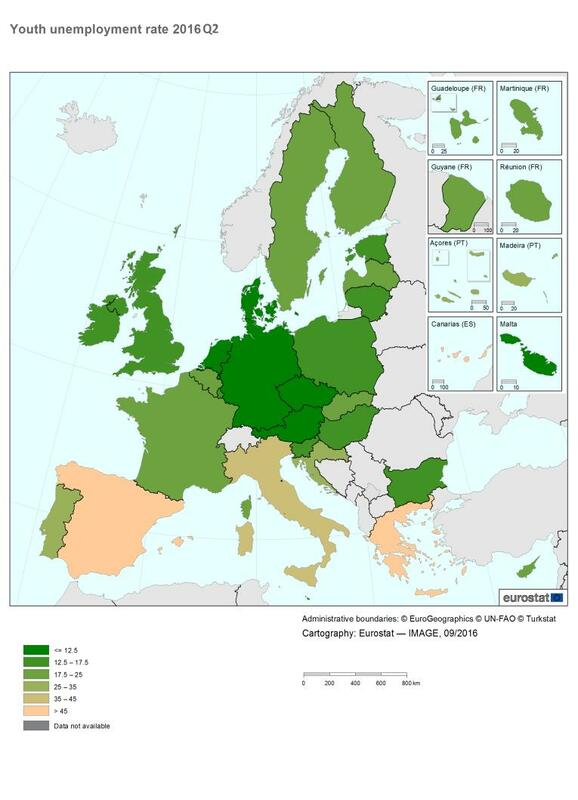 Accordingly, given the persistently high levels of youth unemployment in many regions and the encouraging first results shown, the Commission has proposed to supplement the original allocation of the YEI by EUR 1 billion over 2017 – 2020 (with another EUR 1 billion of matching funding to be provided from the European Social Fund), to thus reach a total amount of EUR 8,4 billion since the launch of the initiative 30 . 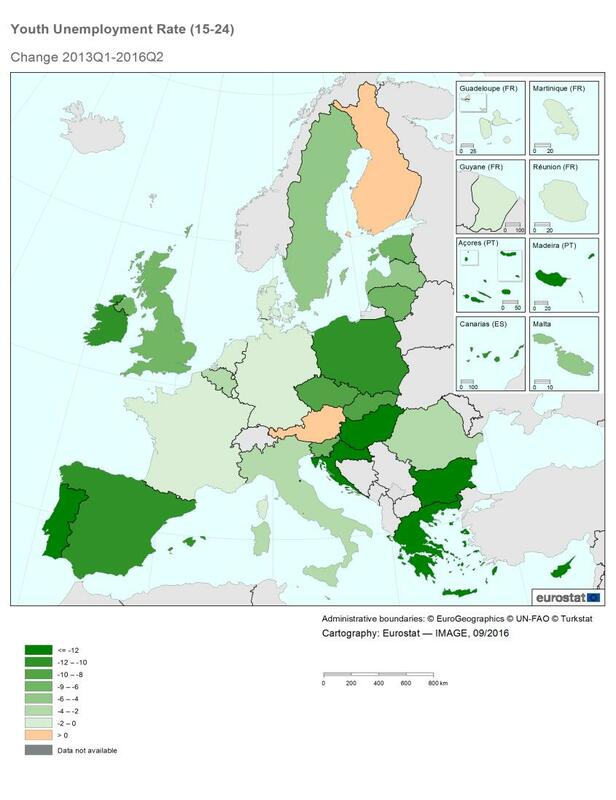 In addition, as announced in the technical adjustment of the Multiannual Financial Framework for 2017 31 , the Commission has also engaged in discussions with Member States who benefit the most of the adjustment of cohesion policy envelopes with a view to focusing the additional amounts inter alia on measures to address youth unemployment. The European Employment Strategy’s Mutual Learning Programme improved transnational learning though a series of peer reviews. 33 A network of national Youth Guarantee coordinators serves to facilitate a continuous exchange. 34 The Youth Guarantee has also been a priority on the agenda of the European network of public employment services, 35 contributing to building their capacity to provide tailored services to young people. Dedicated policy tools provided useful support to Member States to address specific challenges. The Commission launched a Youth Guarantee webpage, 36 organised a working seminar on the design and implementation of Youth Guarantee schemes and a high-level conference, and provided a dedicated advice service on setting up apprenticeship and traineeship schemes in 2013 and 2014. Since 2015, a joint Commission-ILO project provides tailored support on enhancing national capabilities to assess and deliver Youth Guarantee schemes. At the request of the European Parliament, the Commission also directly managed 18 Youth Guarantee pilot projects in seven Member States in 2013. 37 Furthermore, in 2015, the Commission provided an outreach and awareness-raising toolkit to encourage young people to register with their local providers and piloted it in four Member States. Up to nine additional Member States will be supported in their outreach activities in 2016-2017. … while also assisting Member States in launching YEI-funded interventions on the ground. As soon as the legal framework on programming arrangements for the YEI was adopted, the Commission drew up a dedicated guidance paper on the YEI’s implementation and produced detailed guidance on monitoring and evaluation of YEI interventions. Two dedicated technical seminars on YEI were organised with the managing authorities in 2014 and 2016, helping to speed up the designation of authorities involved in the management of YEI-supported programmes. YEI monitoring and evaluation arrangements have been regularly discussed with the managing authorities in the framework of the ESF Committee and ESF Technical working group and the ESF Evaluation Partnership meetings. A comprehensive monitoring framework at EU level has helped Member States monitor the implementation of the Youth Guarantee. This keeps the issue high on the political agenda and helps to constantly improve national schemes. The European Semester has been pivotal in addressing structural challenges related to the Youth Guarantee’s implementation at the highest level. Progress is assessed annually in the Commission’s country reports and through multilateral surveillance reviews of the Employment Committee (EMCO). Country-specific recommendations on improving school-to-work transitions increased markedly in 2014, when a majority of Member States received a youth-specific recommendation. In 2015 and 2016, fewer youth-specific recommendations were issued. This was due to decreases in youth unemployment and to Member States’ progress in addressing recommended reforms, reflecting the Semester’s streamlining (see the SWD for an overview of youth country-specific recommendations and progress in implementation). An ambitious indicator framework for monitoring the Youth Guarantee 38 was developed by EMCO with support from the Commission. Results from two rounds of data collection, for 2014 and 2015, are presented in this Communication. The above responds to the recommendation of the European Court of Auditors on setting up a comprehensive monitoring system. Regarding the monitoring of the effectiveness and efficiency of YEI, the applicable regulatory framework contains a set of specific result indicators for the YEI which makes it more results-oriented. The entire YEI set-up and targeting of interventions to specific regions worst affected by youth unemployment and relevant target groups residing in these regions is indeed a novelty compared with ESF operations. In addition, the YEI-specific result indicators make it possible to trace directly the link between funding support and results and outcomes achieved for the target group. Efforts to boost the provision of apprenticeships and traineeships, youth entrepreneurship and mobility have helped to increase the number of Youth Guarantee offers and could be further improved. Since its launch in 2013, the European Alliance for Apprenticeships has mobilised 31 national governments and 120 stakeholders to improve the quality, supply and image of apprenticeships, mobilising altogether 250 000 training and job opportunities. The 2014 Quality Framework for Traineeships has become an important reference in its field. The European Pact for Youth was launched in November 2015 jointly with CSR Europe. It aims to create 10 000 quality business-education partnerships and provide 100 000 new, good-quality apprenticeships, traineeships, or entry-level jobs over the next two years. Support to entrepreneurship is provided to young people as Youth Guarantee interventions by the public employment services in a majority of Member States, in several cases as part of distinct programmes or projects. ‘Your first EURES job’ has provided targeted support for employment and training in a European context and could be further strengthened in view of supporting youth mobility. Between 2011 and 2014, the scheme supported 4 251 job placements with an overall budget of around EUR 12 million. To complement the existing short term (3 weeks on average) scheme, a pilot project has been recently launched to test longer term mobility of apprentices (from 6 to 12 months) across Member States with the view of establishing later a permanent scheme drawing on the lessons learned. The European Alliance for Apprenticeships is a multi-stakeholder initiative (involving Member States, social partners, chambers, companies, vocational education and training providers, professional bodies, youth organisations and regions) that aims to strengthen the quality, the supply and the image of apprenticeships in Europe. Increased mobility for apprentices is also emerging as an important topic. The Commission provides financial support through specific calls for proposals under Erasmus+ and through other means. The Alliance has developed an Action Plan for 2016 covering 12 key actions to be implemented during the year. The Council Recommendation on a Quality Framework for Traineeships was adopted in March 2014. It has been instrumental in supporting the provision of quality traineeships under the Youth Guarantee. It aims to enhance the quality of traineeships (both in the open market and with active labour market policies) through 22 quality elements that are directly transferable to national legislation or social partner agreements. They relate in particular to learning content, working conditions, and transparency regarding financial conditions and hiring practices. A detailed overview of steps taken by Member States in implementing the Quality Framework for Traineeships is presented in a specific Staff Working Document accompanying this Communication. The Youth Guarantee has received much attention at international level as part of a new, EU-wide approach to tackle high levels of youth unemployment — a shared concern with other regions of the world. Labour and employment ministers of both the G20 and the Asia-Europe Meeting acknowledged the Youth Guarantee as a major structural reform for systematic school-to-work-transitions. The ILO and OECD showcased experiences from early Youth Guarantee implementation with a view to sharing lessons learnt with non-EU countries. Furthermore, the implementation of the Youth Guarantee across the EU is expected to contribute to the first-time quantitative target on youth employment taken at G20 level, i.e. to reduce the proportion of young people who are most at risk of being permanently left behind in the labour market by 15 % by 2025 in G20 countries. Further impetus at global level came with the adoption in 2015 of the 2030 Agenda for Sustainable Development, with its 17 Sustainable Development Goals (SDG). SDG 8 aims specifically at promoting inclusive and sustainable economic growth, employment and decent work for all, and includes a target to substantially reduce the proportion of youth not in employment, education or training by 2020, while aiming to achieve full and productive employment and decent work for all, including for young people by 2030. The Youth Guarantee can play an important part in the EU's approach towards reaching these targets. Continued political commitment and financial support for the Youth Guarantee as a long-term, structural reform is essential in order to reap the benefits of the work carried out so far. Full-scale implementation is still recent in a number of Member States, as many measures have required substantial reforms and broad partnerships: upscaling of initiatives to ensure full coverage should be speeded up in order for the Youth Guarantee to reach its full potential. Stepping up implementation will also involve pursuing monitoring efforts, streamlining existing data collection processes, overcoming technical obstacles and improving the quality of data collected under the common indicator framework. The Youth Guarantee must benefit all young people and all young people must benefit from the first signs of recovery. Yet, despite significant efforts by Member States to improve outreach, young people in the most vulnerable situations, including the low-skilled and non-registered NEETs, are under-represented among beneficiaries. Addressing this challenge will not only require a more efficient outreach approach, but also a broadening of the range of interventions proposed within the four types of Youth Guarantee offers. While the four-month time limit is essential to ensure swift activation, young people facing multiple barriers often need complex, lengthy and individualised interventions before being able to take up an offer. Broadening the set of continued education offers to include pathway approaches and intensified support delivered by a range of partners is necessary to better address their needs. Greater internal coordination and capacity building will consolidate promising partnerships and improve delivery. Implementing the Youth Guarantee has strengthened cooperation among public institutions, and with stakeholders. However, its wide scope also exposed pre-existing gaps. The process is driven primarily by labour ministries, with a weaker involvement of education and/or youth authorities. Besides, the capacity of partners, and in particular public employment services, has faced challenges in view of the large range of tasks to be undertaken. Strengthening cooperation between education providers and employers remains key to expanding the pool of good-quality offers for young people. Although Member States have sought to secure employer engagement, their involvement in practice has been rather limited so far. This results primarily from challenging macroeconomic conditions as well as from difficulties in matching labour demand and supply, weak involvement in the design and delivery of schemes, and limited structured cooperation with public employment services. Greater employer involvement would also improve anticipation of future skills shortages. Introducing better mechanisms to ensure that young people receive offers of high quality is essential. Challenges relate to the short duration of offers and the fact that offers of continued education do not always ensure that a learning outcome has been achieved (e.g. a minimum level of basic skills) or lead to a recognised qualification. Other challenges relate to the lack of regulation of traineeships offers in the open market as regards transparency of hiring, duration and recognition. While variations in the quality of offers depend primarily on the national labour market, they also result from whether and how ‘good-quality’ offers have been defined and provided in practice. For instance, where a good-quality offer is directly or indirectly defined, it generally addresses sustainability of the outcome 40 and the personal satisfaction of the young person. Only a few Member States have set up minimum quality criteria, including for the purpose of monitoring the Youth Guarantee. The Commission, together with the ILO, is working on the identification of the main elements that constitute a quality offer under the Youth Guarantee. This is part of the Commission response to the Court of Auditors recommendation to promote a set quality attributes for Youth Guarantee offers. Moreover, the Commission will explore the possibility of discussing standards for quality criteria in the context of the work on Youth Guarantee monitoring in EMCO. Europe's prosperity and way of life are based upon its greatest asset: its people. The European Commission has taken action to put jobs, growth, investment and social fairness at the core of the agenda of the European Union and has made the fight against unemployment, in particular youth unemployment, a top priority. Despite recent improvements, youth unemployment and inactivity are still above pre-crisis levels and call for continued efforts. The Youth Guarantee has opened up the path for a more effective support to young people in their transition between education and the labour market. Priority should now be placed on pursuing the full roll-out of the national Youth Guarantee Schemes, by accelerating and broadening their implementation, while addressing challenges that have emerged and building more effective interventions underpinned by the YEI and the ESF. This Communication contributes to this process by demonstrating the main success factors and identifying areas where further action is necessary. The Commission will further support mutual learning and the exchange of best practices among Member States. Member States will continue to use YEI support until 2018 provided there is still funding from 2014-2015 available. In order to allow for the continuation of the YEI, as part of the review of the Multiannual Financial framework 2014-2020 41 , the Commission has proposed to supplement the original allocation of the YEI by EUR 1 billion over 2017-2020. This amount is to be matched by an equal contribution from the European Social Fund. Ensuring sufficient additional EU funding resources for youth employment as from 2017 remains a top priority for the Commission. As identified in the 2016 Letter of Intent, the Commission intends to step up its efforts in support of youth more generally, and the Youth Guarantee instruments should play their full role as part of a broader set of youth initiatives. For instance, the establishment of a European Solidarity Corps was announced by President Juncker during his State of the Union speech on 14 September 2016. The Corps will be rooted in the core EU values of engagement and solidarity and will offer socially-minded young people under 30, benefitting from the Youth Guarantee or not, the opportunity to help and support others and acquire new skills and experience, either in their home country or in another Member State. As regards apprenticeships, the implementation of a pilot project for the longer term mobility of apprentices will provide the necessary knowledge and experience to design a more permanent scheme in the near future. Moreover, the development of a quality framework for apprenticeships would complement the existing strategy which aims at valorising apprenticeships and making them more attractive for young people and companies alike. This policy agenda for young people, notably the principle of active support for sustainable labour market integration and the commitment to upgrade their skills and qualifications, is an important part of the Commission's broader efforts to promote upward convergence, within and between Member States. This is also the rationale of the European Pillar of Social Rights, which is currently the subject of a broad consultation, and which the Commission will present next year. Annex – External reports and evaluations of the Youth Guarantee. (1) European Commission (2015), EU Youth Report 2015, Publications Office of the EU, Luxembourg. (2) 2013/C 120/01 of 22 April 2013. (3) Please note that these figures are based on data collected under the Youth Guarantee indicator framework and estimations for 2016. Detailed data are presented in the accompanying Staff Working Document on the implementation on the Youth Guarantee and operation of the YEI (SWD (2016) 323). (6) In March 2016, the Council noted that the Youth Guarantee has ‘acted as a powerful policy driver in a number of cases’ and that ‘in order to reap the benefit of the work carried out so far, continued political commitment to the Youth Guarantee as a long-term, structural reform is essential’. Council of the European Union, 6154/16. (7) The European Parliament urged ‘the Member States to implement fully the Youth Guarantee’. 2015/2351(INI). (8) For more detail see the accompanying staff working document (SWD (2016) 323. (10) A person is economically inactive if he or she is not part of the labour force. So inactive young people are neither employed nor unemployed, meaning that they are not working and not available or looking for work either. .
(11) Country-specific information can be found in the country fiches annexed to the Staff Working Document. (12) Eurofound (2016), Exploring the diversity of NEETs, Publications Office of the EU, Luxembourg. (14) Source: European Commission, LABREF database. (15) The clustering is based in particular on the number of youth-related measures in 2013-2015 as highlighted in the LABREF database. The outcomes were then reviewed in light of a more qualitative analysis focusing in particular on the state of implementation of the Youth Guarantee and the scope of measures (based on EMCO, European Commission country reports, European Employment Policy Observatory national expert analysis). (17) Council Recommendation of 10 March 2014 on a Quality Framework for Traineeships (2014/C 88/01). (18) European Network of PES, Report on PES implementation of the Youth Guarantee, 2015. (19) Take-up of an offer occurs when a young person actually starts an offer that they have previously received and accepted — i.e. starts employment, continued education, an apprenticeship or a traineeship. (20) Results reflect the state of Youth Guarantee implementation and other data-related issues and therefore data comparability across countries is limited. (21) The analysis is based on the findings presented in greater detail in a technical paper, European Commission (2016) 'Analysis of the performance of Youth Guarantee in the EU Member States 2013-2015' (publication forthcoming). (22) Country specific information can be found in the Annex B of the accompanying Staff Working Document . (23) Regulation (EU) No 1304/2013. (24) EUR 64.6 million in Italy and EUR 23.5 million in Bulgaria. (25) Information from the ESF Managing Authorities collected ad hoc by the Commission in July 2016. (26) The first YEI national evaluations were submitted by Member States at the end of 2015, in accordance with the regulatory framework. A second national evaluation is required from Member States by the end of 2018. (28) European Commission (2016), "First Results of the Youth Employment Initiative"
(31) Technical Adjustment of the financial framework for 2017 in line with movements in GNI and adjustment of cohesion policy envelopes, adopted pursuant to Articles 6 and 7 of Council Regulation No 1311/2013 laying down the multiannual financial framework for the years 2014-2020, COM(2016) 311, 30.6.2016. (33) Preventing early school leaving and smoothing the transition from education to employment were also high on the mutual learning agenda in the policy fields of education and youth. (35) http://ec.europa.eu/social/main.jsp?catId=1100&langId=en . In particular, the network undertakes an annual monitoring of public employment services’ implementation of the Youth Guarantee. (38) Employment Committee, Indicator framework for monitoring the Youth Guarantee, INDIC/10/12052015/EN-rev. Key messages on the way forward for the Youth Guarantee post-2016, incorporating EMCO’s report on the state of play of the implementation of the Youth Guarantee, ST 6154 2016 INIT. (40) An outcome-based approach considers that, in general, an offer is of good quality if the person who benefits from it achieves sustainable labour market attachment. That is to say, the beneficiary does not return to unemployment or inactivity thereafter; a ‘good quality’ offer can thus be measured by its outcome.